Robb throws his hands in the air, frustrated that he just lost his lunch. By February 7, 1996, Robb’s body was not tolerating the AIDS drugs he had started during the previous weeks. He was energetic while sitting on the couch, but weak when he engaged in activity. More troubling was the fact that he was losing a lot of the food he was eating each day. Despite feeling badly, Robb was still directing the renovation of the shelter for DeLaCerda House, which would provide transitional housing for homeless HIV and AIDS clients in the Quad Cities. Getting the shelter open was Robb’s main mission in life, along with staying alive. I went over to his house to do our weekly story. Fortunately, his father Lorney was there, and while I was taping, John Brown stopped by. This is one of the rare times that my voice was heard. When Robb was bending over the sink, I asked what happened. Then I answer when he asks what time it is. Now that it is 20 years later, and I have had my own serious health issues, I know the feeling of frustration he displays when he throws his hands in the air. At this point, Robb’s body is rebelling, and there is nothing he can do about it. 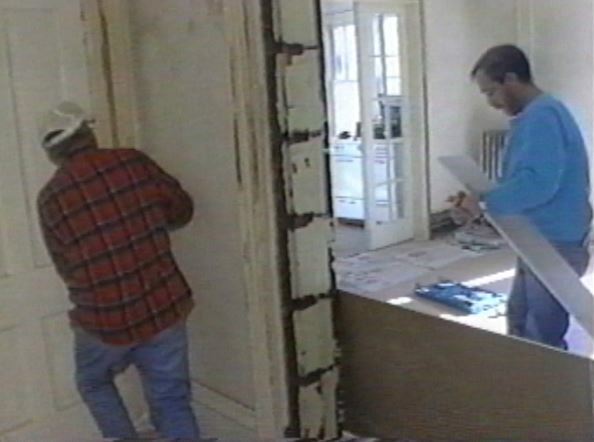 1996 began with Robb with a little sweat and a little spackle, still working hard to get the house ready to open so homeless HIV and AIDS clients could have a place to stay. Within 5 months, the house would be named “Robb’s House” and would be owned and operated by the DeLaCerda House, a nonprofit organization. We had been doing Robb’s Life stories since April, almost nine months. He had not expected to live to see 1996, but here he was, making the most of his time. I was disappointed when we shot this story right after the first of the year that he had celebrated his 34th birthday on New Year’s Eve and had not told me that his birthday was coming up. I’m not sure what bothered me the most — that I didn’t know his birthday (how could I have not asked this basic question?) or that he didn’t tell me about it. My holidays had been very busy, with a new relationship that would become a marriage in September of 1996, and with a trip to Lexington to visit friends and family. But for 20 years, I have regretted not being at Robb’s 34th birthday party with my camcorder. I would not have another chance. In this episode, Robb also shows the permanent IV that was put into his chest for more effective medicine delivery. At this point, every day was a gift. You can still donate to the DeLaCerda House and help keep Robb’s legacy alive. Go to www.delacerdahouseinc.org and click on the “Donate” button on the right side of the screen. 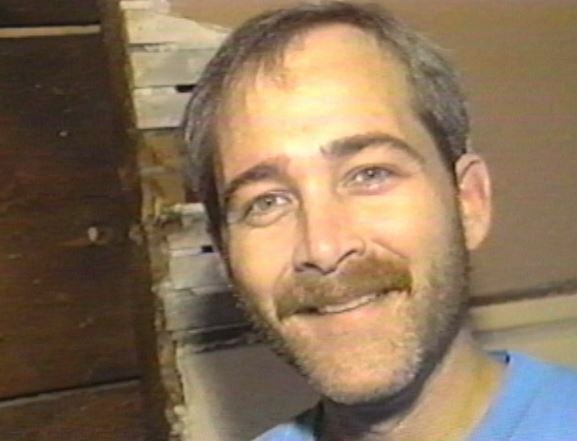 Twenty years ago this week, Robb was racing to renovate the abandoned house in Rock Island into a shelter for homeless HIV and AIDS clients. Along with his father, Lorney, and a friend, Ray Williams, Robb was hanging drywall and doing other work to make the old house inhabitable. This would be Robb’s final Thanksgiving, and he was amazed that he was still alive and feeling well enough to hang drywall. I remember shooting this piece very clearly, and when I was editing, I noticed there was a look in Robb’s eyes that had not been there a few months earlier. It was the look of someone who is sick, whose body is struggling. But when he smiled, his eyes sparkled as they always did. It was clear that he was not smiling as often these days. Renovating the interior of what would be known as “Robb’s House.” Ray Williams is on the left. But Robb was focused intensely on providing shelter for homeless HIV and AIDS clients — people who were less fortunate than he — so he was pouring his limited energy into the DeLaCerda House. 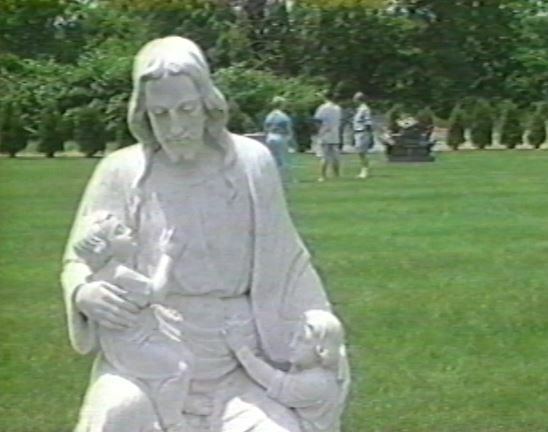 Twenty years later, his work is still doing a lot of good in our community. After all these years, you can still help, and that is the reason that we are honoring Robb’s memory during this 20th anniversary year of Robb’s Life. Please help keep Robb’s legacy alive by donating, even just a few dollars, to the DeLaCerda House. Just go to their website at www.delacerdahouseinc.org and click on the “Donate” button on the right side of the page. And don’t miss WHBF-TV’s special news series this week updating Robb’s Life 20 years later. Watch WHBF Local 4 News at 10:00 p.m. on Monday, Tuesday, and Wednesday, November 23, 24 and 25.